Muktinath, Mustang (May 12, 2018) – Indian Prime Minister Narendra Modi, who is on a two-day State Visit to Nepal, paid homage at the Muktinath Temple in Mustang this morning. He arrived at Muktinath at 7:55 on a special helicopter of the Indian Air Force. Upon landing at Muktinath, the Indian dignitary was welcomed by Federal Minister for Culture, Tourism and Civil Aviation Rabindra Adhikari, Chief Minister of Province 4, Prithvi Subba Gurung, Province 4 Minister for Internal Affairs and Law, Hari Bahadur Chuman among other officials. Former ministers, lawmakers, people’s representatives, district-based government officials, security officials, office-bearers of the local organisations and the members of the general public from Muktinath also welcomed the Indian PM. The Hindu batuks (priests) chanted the auspicuous Vedic hymns and the Buddhiost anis (jhuma) played the Denge, the typical musical instrument used in the Buddhist culture, when Modi entered temple main gate. According to Krishna Prasad Subedi, the temple priest, Modi offered worship at the temple as per the shodasopachara rituals. “He himself performed the aarati and archana rituals,” Subedi said. Although there was no formal welcome programme and reception planned in his honour, Nepali dignitaries and some organisations had presented souvenirs to the Indian Premier. On the occasion, Minister for Culture Rabindra Adhikari and Chief Minister of Province 4, Gurung presented shaligram (fossil ammonite) considered sacred in the Hindu religion. Similarly, the Baragung rural municipality at Muktinath presented a copper plaque and a rug made of sheep wool. Chhiring Lhamo Gurung, the Chief of the District Coordination Committee, Mustang gifted a carpet to Modi. Local organisations as the Muktinath Development Committee, local Mothers’ Groups also presented articles reflecting the local identity. Along the way a local man put a typical cap (Chhiring Kinga) worn by the Bhote Gurung community on the head of the Indian Prime Minister. 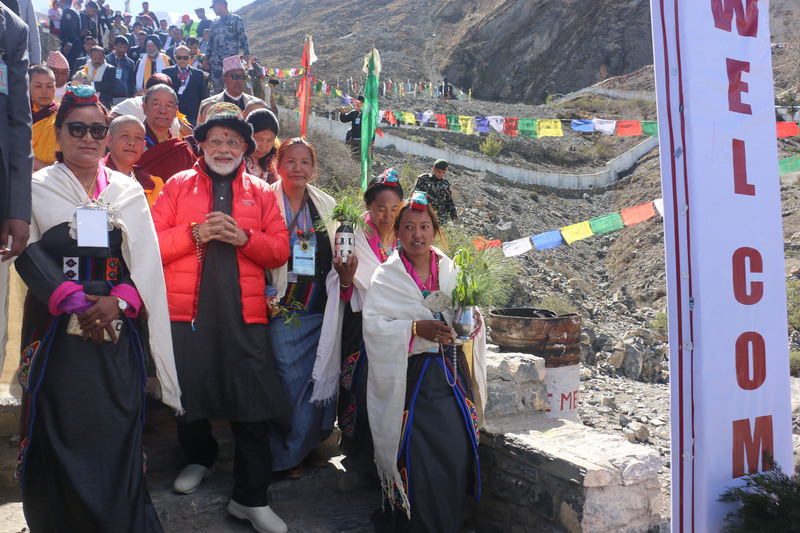 The locals were amused when Modi, who was enjoying the scenery of the shining snow-clad Himalayan mountains around Muktinath, started playing the local Denge musical instrument. The Indian Prime Minister also chatted and exchanged pleasantries with the locals although the security persons tried to keep them at a distance. Modi is the first foreign VVIP guest coming for a visit to Muktinath. It is believed that Modi’s visit and pilgrimage to Muktinath will help in the publicity of this famous religious tourism destination. Apart from promoting tourism, Modi’s visit to Muktinath has also been associated with the development of the area. It is believed that the visit would be yet another step towards further consolidating the cultural and religious ties between Nepal and India. The Mustang folks see Modi’s visit to their district as fruitful in promoting the exchange of cooperation, boosting bilateral ties and friendship.